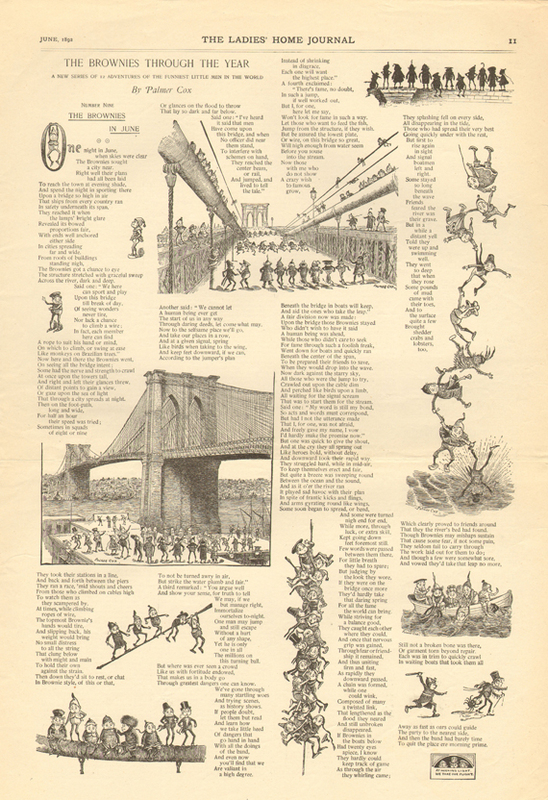 The Brownies visit the Brooklyn Bridge in the Ladie's Home Journal, June 1892. You might be wondering who Palmer Cox and the Brownies were. Have you ever heard of the Kodak Brownie Camera, introduced in 1900? The camera was named for Cox’s Brownies, then a 17-year phenomenon. While largely forgotten today, Cox was a beloved household name for children in the 1880s through the early 1900s. The Brownies were the first cartoon figures to be used in mass merchandising, later influencing Beatrix Potter and Walt Disney, among others. Based on Scottish folklore figures, the Brownies were an adventurous and mischievous group of little men who evolved from being similarly illustrated characters into individuals with their own personalities, nationalities, and occupations who nevertheless lived, traveled, and performed good deeds together. They first appeared in “The Brownie’s Ride” in the February 1883 issue of St. Nicholas, a children’s periodical that published stories by writers such as Louisa May Alcott, Laura Ingalls Wilder, Rudyard Kipling, and Jack London. Brownie stories combining rhyming verses with illustrations continued semi-regularly in this magazine and in Ladies Home Journal for the next 30 years. Throughout, the Brownies were on the cutting edge of trends, engaging in sports like bicycle-riding and tennis, riding cars, and visiting the Brooklyn Bridge and the 1893 Columbian Exposition in Chicago even before the fair opened. While they did experience minor accidents and problems along the way, the Brownies always overcame these with good cheer. The stories were later compiled into books like Brownies, Their Book and Brownies at Home. A perfect blend of fantasy and adventure with gentle moral lessons of kindness and virtue made the stories enormously popular for children of the time. Fan mail from children inundated Palmer Cox who was reputed to answer every letter he received. An 1892 letter to a Miss Luckenboit in our collection describes why the Dude was one of the most-loved Brownies. Quite the dandy, the Dude wasn’t as fearless as the others, but always remained good-natured. As Cox explains, “He comes the nearest to being a girl of any one in the band, as he is the most admired, and at the same time the most harmless.” Other popular characters were Uncle Sam, the Cowboy (suggested by none other than fan Teddy Roosevelt! ), the Policeman, the Sailor, the German, and the Chinaman. While the German, the Chinaman, and other figures based on nationalities may seem politically incorrect to us now, these characters and their stories of visiting their countries helped children learn and become familiar with other cultures at a time of massive immigration. By the 1890s, the Brownies could not be confined to the printed page and burst into the advertising and merchandising worlds as companies sought to ride the Brownie wave to increased sales. Small Brownie paper dolls were placed in packages of Lion Coffee and the New York Biscuit Co., prompting children to beg parents to buy more to collect entire sets. A band of Brownies playing musical instruments paraded across trade cards for Estey Organ Co. Twelve characters were fashioned into seven-inch cloth toys manufactured by Arnold Print Works of Massachusetts, a very successful dress goods printer. The Brownies transformed into rubber stamps, card games, blocks, puzzles, and even bowling pins. They even appeared on household furnishings like carpets, wallpaper, fireplace sets, china, glassware, flatware, and of course, Kodak cameras. The Brownie empire reigned. I have more research to do on these charming creatures and hope to share my findings online in upcoming months. Keep coming back to our online exhibitions Web page! This entry was posted in Ephemera, Library and tagged Brownie Camera, brownies, marketing, Palmer Cox, paper dolls. Bookmark the permalink. I’ve never seen a Brownie rug – what a great object to own! Our library has several trade catalogs dated 1902-1926 from the Hartford Carpet Co. but with no images of that rug. Information on the company is at this website: http://www.enfieldhistoricalsociety.org/EHScarpet.html. I’ve asked a Palmer Cox scholar for any information on the rug and once she’s checked her files, I’ll forward the info on to you. Thanks for your interest. I apologize for the delay in responding with more information on the rug. The Palmer Cox scholar I contacted checked her files, but only found two images of the rug (or similar one): http://www.browniecamera.nl/palmer_cox_brownies.htm and http:www.browniecamera.nl/wpimages/wp639abdbb_05.jpg. These images show Palmer Cox in a room, most likely in his home “Brownie Castle” in Granby, Quebec. It’s fun to know he owned a Brownie rug. I know it’s been a while, but I have some information on the Brownies rug. I believe it was actually manufactured by Kensington Art Squares (KAS). I have some references to it, if you are still interested. “The Brownies must have been here !”. I gathered that this was something from her childhood, but never realized there where it came from, nor how widespread and popular a phenomena they were. My sister and I still refer to The Brownies when we notice that something nice has been done in secret. Thanks for a lovely post. Am sure The Brownies proofread it while you were asleep, to ensure all was in order for you. Diana, I’m glad you found our blog which helps to explain some lovely childhood memories. The Brownies were extremely popular for decades, making it surprising that more hasn’t been written on them and Palmer Cox. 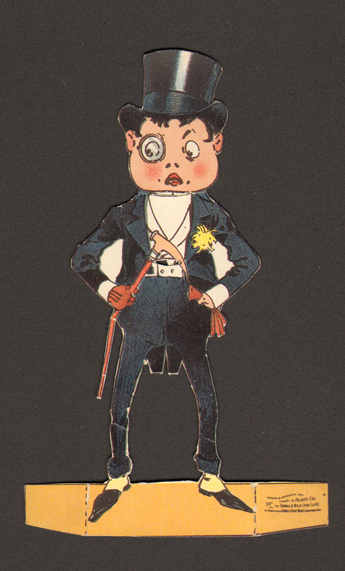 I hope to someday create an online exhibit showcasing our library’s Brownie ephemera, so keep checking back for more. When I was a little girl, I often admired a tea set of my maternal grandmother, and I suppose she told me they were her “Brownie dishes”, but of course this meant nothing to me. My mother died in 1995 and I inherited this tea set, and in my retirement (I am now 70) , I decided to research the dishes. One thing has always puzzled me. Almost every character is smoking – on a child’s tea set. Can you tell me why? Hi Judy, china sets featuring the Brownies were very common in the late 1800s and early 1900s. Cigars were so popular between 1870 and 1920 (Americans’ average annual consumption rising from about 1 billion in 1870 to over 8 billion in 1920) that even the Brownies “smoked” them. They also appeared on greeting cards with cigars (check out ebay’s Brownies listings). Warnings about tobacco weren’t issued until the 1960s. How times have changed! Enjoy your tea set. My father just passed away and we just found a bound collection of The ladies Home Journal Brownies Through The Year, ‘Round the World, and other stories from Oct 1891 to Nov 1894. They are in good condition. Do you have any information about this? Do they have any value? Reading with pleasure. I’ve been collecting individual brownies from eBay – they seem to turn up all the time. The most common are premiums offered in Lion Coffee, and fall into two groups: standing brownies with connected heads – these are about 5 – 5 1/2 inches tall, have little tabs on the feet meant to bend back and allow the figure to stand independently ( and on the left side are identified – such as “The Dude”; ) and the more interesting mounted series. These came in three parts – heads, bodies, and animals on which the figures were to be mounted. The animals had folding tabs on the side so they could be stood up and the tabs were printed with the country or cuklture of origin of the animals – and these would be humorously paired with figures dressed in various national costumes – all imaginatively designed with topknots, typical hats or headgear ( like turbans ) and whose heads and bodies fit together with sliding tabs. So a standing animal would have a figure mounted on its back, with one leg showing, and the head also tabbed onto the body. On the back of the figures head was printed the county or culture of origin, so they could be accurately paired with the correct animal – or mismatched as owner desired. You can imagine a child collecting these die-cut figures in their room, standing them up on a shelf or a dresser and making up stories; or a mother amusing her children by keeping them in the kitchen and bringing them out to tell stories with cookies and cocoa being served. I have heard there were 25 sets of these brownie figures with different nationalities. Do you know any more about them ? Have a Brownie Cup and Saucer from my mother – is it valuable? help – this is very interesting! thank you for answering!! Palmer is my great grandfather’s uncle — I have an original Brownie book signed by him — it was a Christmas present to one of his nephews — bestowed on me by that “nephew’s” wife after he died, since I am the family genealogist. My 2nd great grandfather is Franklin Cox, married to Lucy Parmelee, and my great grandfather is Marcus Cox, married to Minetta. I have been to Granby several times – almost purchased the “Brownie Castle”, sadly it is not well kept up — and is a duplex with no stained glass windows and while the turret is still there, it no longer resembles a “castle”. Fun to find this blog!!!! I enjoyed your article on Palmer Cox Brownies and thought you might be interested in the line of Brownie dolls that our company has been producing for the past few years. We love the illustrations and stories and couldn’t resist bringing them to life in doll form. You can find photos of them on our web site if you have the chance to look. Hello Alan!!! You are Allen from the Eastern Townships, yes? I’m doing some research right now on General Patton’s set of Brownies! I have a small framed card , a little bigger than a business card with a drawing of a brownie and handwritten: ” Charles H. Griffiths from Palmer Cox, Brownieland Aug. 4th 1906 ” Is this a collector’s item ? Hi. I have a watercolour that looks like Palmer Cox’s work, but I can’t find a signature. How would I go about authenticating it? I have an aquarium setting of Brownies that my mother gave to me when I was a boy. It looks like a woman haters meeting of some sort. There is a chairman in the front behind a desk and several other Brownies attending the meeting. It is a fully furnished Victorian room with widows and drapes. Also framed miniature pictures and porcelain statues. Would love to find out more about it. Can send pictures if anyone can help me. I recently found a hankie with palmer cox brownies images. It is very fragile actually tearing down the middle. I had noticed that the name initially as my maiden name is palmer. Then the images were so endearing that I had to learn more. It was manufactured by Arnold print works, pat. July 10 1854. Any more information would be appreciated. I came across a package with a ” set of 4 “BROWNIE” patterns. Printed in color on antiqued muslin. Just cut out, stuff and sew. Makes 4 different 6″ Brownies- replicas of the antique originals created by palmer cox. Do you know anything about these prints? my name is Robert live just outside Atlanta Ga, I’m a big fan of palmer cox and the brownie’s I have collected just about every brownies book including squibs of California (1874), the brownies, their book (1887), brownies through the union (1895), the brownie clown in brownie town 1907), just to name a few , most are first edition some with dust jackets, also items like, the brownie calendar, brownie rubber stamps, post card of the brownie castle (home of palmer cox) in Canada and much more, I think it would be a great idea to form a brownie/palmer cox fan club, what do you think? Robert ? I recently bought a group of old magazines including many issues of The Cottage Hearth, published in Boston in the late 1880s. 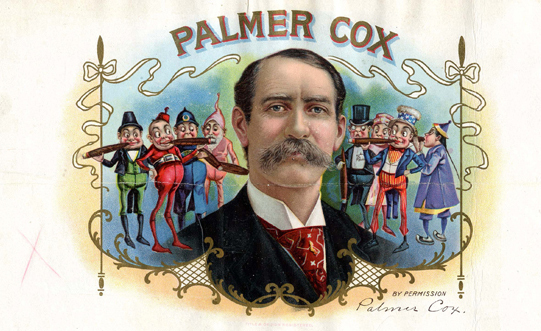 Three of the issues have Palmer Cox Ivory soap ads on the back cover. One of them, the June, 1885 issue, has a Brownies Ivory Soap ad on the back cover plus a two page Brownies story ” A Friendly Turn” inside. There are two illustrations on each page. I was hoping you might be able to give me some idea of the rarity and value of the magazine. Any help would be appreciated. Hi Walter. We don’t offer valuations of collectibles. I imagine with a quick search online, you should be able to get some idea of the value. As for the rarity, I will ask our library staff to see if they have any ideas. Thank you. all in very good condition. I would be interested in their value. Where do I start? You can check online auction sites to help with current values or check with an appraiser. To find one in your area, search http://www.appraisers.orghttp://www.appraisers.org. I have an original brownie rug in mint condition I am curious of the value and where I can sell it. Hi Danny, we don’t give estimates on antiques but if you talk to a few antiques dealers, they might be able to give you an idea of the value. Thanks. Did you sell the Brownie rug? I am interested in it. Would love to know about the rug since I have been searching for one. This might be years too late to matter, but I have found information on the Brownies rug that Kevin Thurber was trying to research. It was actually manufactured by Kensington Art Squares (KAS), I believe the designer may have been Florence Cory. I have some references if anyone is interested. I would suggest you do a search on Google or reach out to an antiques dealer. That’s probably your best bet for finding a value. Thank you!